Tony Canzoneri, along with fellow Lightweight & Junior Welterweight champion, Barney Ross, remains one of the most enduring & beloved fighters in the history of the sport. When you consider that he fought in an era of only 10 weight divisions with one champion each, it makes his career even more remarkable. Tony won 5 world titles in 3 different divisions! Featherweight, Lightweight (twice), & Junior Welterweight (twice). In 1927, at the callow age of 19, Canzoneri fought to a draw in his first title fight as a bantamweight against Bud Taylor. In 1928, he won the featherweight title from Benny Bass (W-15), only to lose it later the same year to France's Andre Routis (L-15). Two years later he won his first lightweight crown with a sensational one round kayo of Al Singer. The following year, 1931, Tony claimed the Junior Welter title by knocking out the legendary Jackie "Kid" Berg in three rounds in a lightweight title fight, then defended defended his titles against the tough Cecil Payne (W-10), Berg (W-15), Phillie Griffin (W-10) & the also legendary Kid Chocolate (W-15). In 1932, Canzoneri lost the Jr. Welterweight championship to Johnny Jadick (L-10) & also lost a rematch (L-10). Tony capped off the disappointing year by successfully defending the Lightweight title against another all-time great, Billy "The Fargo Express" Petrolle (W-15). Tony regained the Jr. Welter title from Battling Shaw in May of 1933 (W-10). Shaw had only held the crown since February when he beat Jadick by 15 round decision. Canzeneri went on to lose both of his titles later in '33 when Barney Ross decisioned him twice (L-10, L-15). He closed out the year by beating future Jr Lightweight champion, Frankie Klick (W-10), Kid Chocolate KO-2), & Cecil Payne (KO-5). In 1935, Canzoneri won his last title beating the great Lew Ambers (W-15), for the vacant Lightweight championship. The title had been vacated by Ross when he won the Welterweight title from Jimmy McLarnin. Tony defended the title once in '35 beating Al Roth by 15 round decision. Canzoneri began 1936 with a series of non-title fights. The most notable opponents being his old nemesis, Johnny Jadick (W-10), yet another all-time great, Jimmy McLarnin (W-10), and Midget Mexico (KO9). In September he lost the title in a rematch with Ambers (L-15). Tony's last title fight was in 1937, when he again lost a 15 round decision to Ambers. Canzoneri fought on for two more years. He finally retired in '39 after suffering the first KO loss of his career to the star-crossed Al "Bummy" Davis in 3. Following his retirement, Tony became an actor & restauranteur & was a well loved boxing figure in New York City; where he died after a heart attack on December 9 1959. 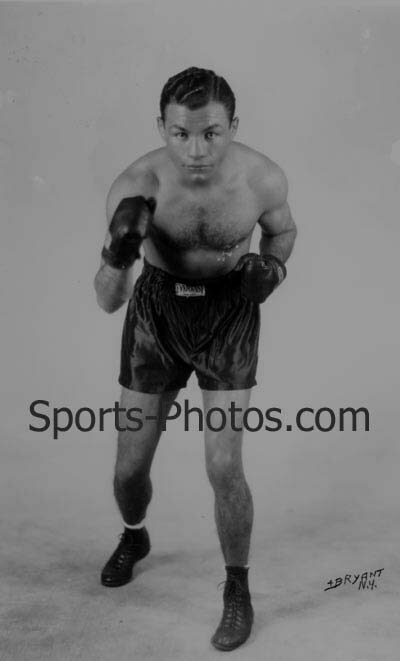 Tony Canzoneri was absolutely one of the greatest fighters pound for pound in the history of boxing.